Are you drinking enough water? If so, you deserve a medal or golden chalice. We are supposed to be drinking at least half an ounce of water for each pound we weigh. That's a lot. Personally, I hate drinking water and have come up with a handful of tricks to help get all those ounces in. Most important thing to remember - You need it! How are you supposed to be your best self if you're brain and body are struggling for something it needs? The more hydrated you are, the better you will feel: less frequent headaches, a stronger immune system (less colds! ), a strong sense of mental clarity, less weight gain, energized body, less wrinkles, and happy bladder, kidneys and colon. All important things, right? Right. 1. H20-lympics! When I was a bartender we would make things a little competitive by each filling up pitchers of water and try to make progress through out the shift. It's silly but there's no better way to get that determination going than with a little competition. 2. Buy a quart sized container and fill it up with water twice throughout the day. Something with a nice, big mouth is better than a sports cap since you can take giant, satisfying gulps and chugs. Yum. I've found this to be the best, most reliable method. I drink one quart water at work and then another when I get home. 3. Flavor your water! Add some fruit, mint, cucumber, citrus slices to those water containers you're filling up. It tastes better and adds health benefits. Just keep in mind that drinking lemon water throughout the day is not great for your tooth enamel because of the acid so mix it up. 4. Drink out of an eight ounce cup so you can count your cups consumed each day. You'll need to drink about 8 of them. I do this all the time at home and Cameron thinks its funny but it works! I keep an actual measuring cup by the sink just for this - accuracy is important to me - just don't lose count. 5. Set reminders on your phone. There are apps for this or simply set a few reminders on your phone to pop up throughout the day. 6. Consider starting a health journal with a water log. This way you will be able to see how wonderful you feel as a more hydrated person - or if you forget, how tired and icky you feel. 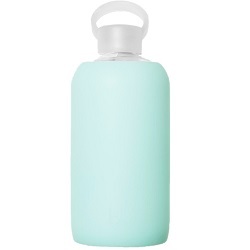 Here are some safe, non toxic, bpa free water bottles - each holds 32 ounces and features a different size top.